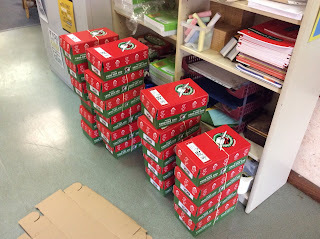 We finalised the packing of the shoeboxes yesterday. Thank you for your support in this incredibly important initiative for our school. We were able to pack over 20 shoe boxes to be delivered to children in need around the world. 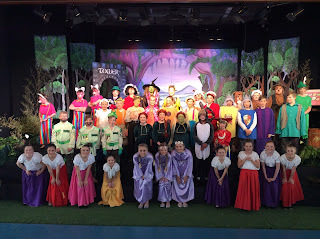 Week 10 Update...The End of a Very Busy Term! Good morning and welcome to our last post for the term. I would like to start off by saying a massive thank you to you all. I have so appreciated all that you have been doing to help throughout the term in addition to having your child ready for school each day! I am very lucky to have such a supportive parent group that willingly puts up their hand to help in so many ways...I really appreciate and value all the support that has been given to myself and the students! It has been a very busy one with Retreats, Confirmation, Home Masses, School Photos, Cross Country, Shrek, Football games and a whole lot of learning! Shrek Photos - I have put the photos taken during Shrek preparations on Web Dav Nav for the students to access, if you have any photos it would be greatly appreciated if you could get them to me on a USB so that I can share them with the students. Thank you! Welcome to Week 9, it is shaping up to be a busy one for the parents and students of Silver Room so my focus this week is making sure that our routines and classroom procedures are consistent so that the students can be as prepared as possible for our performances this week. 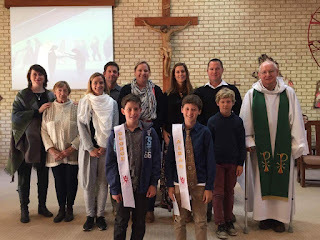 I would like to congratulate Jeremy and Zac and their families on a lovely Confirmation ceremony yesterday morning. The boys were very reverent and respectful and were a credit to our class. Thank you to Polly, Abbey and Greta for taking the time to come along and support the boys, I know they and their families really appreciated it! Just a few reminders for the last couple of weeks of term. Uniform- Sports Uniform is to be worn by the 5's and 6's all week. Your son may need to leave their grey school pants and black school shoes here as part of their costume. Please make sure this comes with them to school tomorrow.